I have loved the novel Pride and Prejudice since I was around 12 and first got my hands on it. I’ve always been a fan of the classic story, and never really took to any of the adaptations that have been made. This changed when I stumbled upon the web series The Lizzie Bennet Diaries. At first I was skeptical of the adaptation, but I was soon hooked. This book is like a companion to the web series, but it can also be read as a stand-alone book. 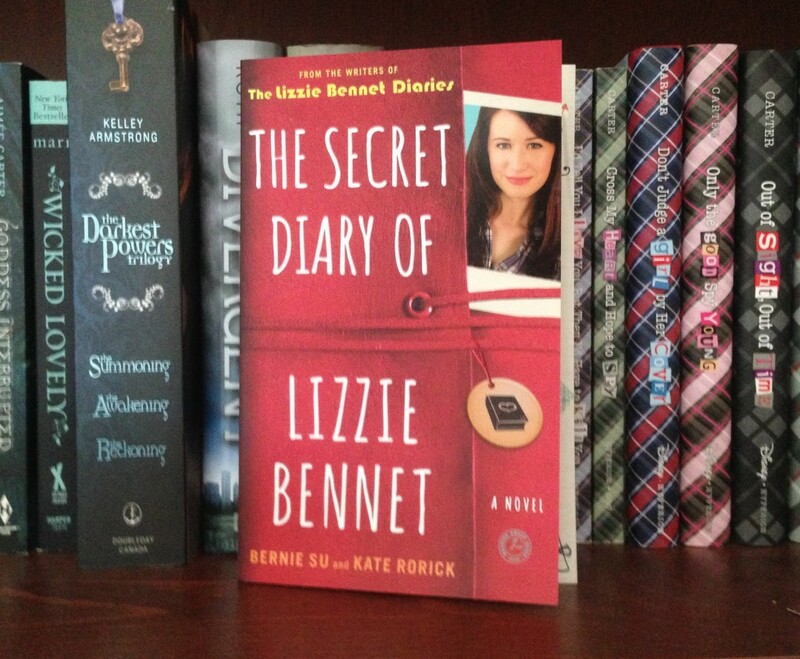 The Secret Diary of Lizzie Bennet follows the inner thoughts of Lizzie Bennet as she tries to forge a path for her life and get through her graduate studies. It has all the characters that are so well loved (or loathed) in the classic series and is full of ups and downs. Without giving anything away, the story is basically a modernized version of the classic Jane Austin novel. I honestly loved the book. I was a bit worried it wouldn’t be as interesting since I had already seen the web series, but it added so much to the story. In the web series you only get tiny glimpses of what is going on in Lizzie Bennet’s life. This book fills all the holes and questions that the web series never touched on and it doesn’t feel like the show is just being re-hashed. I highly suggest reading this book if you are a fan of Pride and Prejudice or The Lizzie Bennet Diaries. This entry was posted in Books and tagged Books by Sarah. Bookmark the permalink. Wonderful blog! Do you have any recommendations for aspiring writers? I’m hoping to start my own blog soon but I’m a little lost on everything. Would you advise starting with a free platform like WordPress or go for a paid option? There are so many choices out there that I’m completely overwhelmed .. Any suggestions? Thanks! As a new blogger I would suggest starting with a free platform (I actually use WordPress and love it). You could try something like blogspot if you don’t want to worry about having to host your website. The free platforms are the best to start with because if you find that blogging isn’t for you, then you haven’t spent money on something you’re not interested in. Best of luck on your blog! Hey! I understand this is sort of off-topic however I needed to ask. Does operating a well-established website like yours require a lot of work? I am brand new to writing a blog however I do write in my journal on a daily basis. I’d like to start a blog so I can share my own experience and views online. Please let me know if you have any kind of ideas or tips for new aspiring blog owners. Appreciate it! I wouldn’t call my blog well-established as of yet, but it does take constant checking and updating. I wouldn’t say it take a ton of work, but you do have to constantly work on posts, updates, replying to comments, etc. As long as you keep up with it at least a few times a week you should be okay, but since you journal on a daily basis you probably know how to organize your time so you can check-up on your blog. Best of luck! Right now it appears like WordPress is the preferred blogging platform available right now. (from what I’ve read) Is that what you are using on your blog? I believe you can add your twitter feed by using Jetpack, but I haven’t really tried out that feature. I’ve tried a few, but I find I still have to go through the spam box once in a while to pick out all the non-spam comments that accidentally found their way into the spam box. Hey! Someone in my Facebook group shared this site with us so I came to look it over. I’m definitely enjoying the information. I’m bookmarking and will be tweeting this to my followers! Great blog and fantastic design and style. Do you mind if I quote a few of your articles as long as I provide credit and sources back to your website? My blog site is in the very same niche as yours and my visitors would really benefit from a lot of the information you present here. Please let me know if this alright with you. Thanks! My partner and I stumbled over here from a different page and thought I might check things out. I like what I see so now i’m following you. Look forward to checking out your web page yet again. I’m pretty sure there’s a way to add your twitter feed into your site by using Jetpack (if you’re using WordPress). However, I haven’t played around with it much. Glad to hear you’ve been enjoying my blog. Thanks for reading! Have you ever considered about including a little bit more than just your articles? I mean, what you say is valuable and all. Nevertheless think about if you added some great visuals or video clips to give your posts more, “pop”! Your content is excellent but with images and video clips, this blog could undeniably be one of the greatest in its niche. Good blog! I have been adding more pictures to my more recent posts, but I’m still playing around with it. Hmm it appears like your website ate my first comment (it was super long) so I guess I’ll just sum it up what I had written and say, I’m thoroughly enjoying your blog. I too am an aspiring blog writer but I’m still new to everything. Do you have any suggestions for beginner blog writers? I’d certainly appreciate it. My only suggestion is to write what you know. I know it’s probably obvious, but writing about what you like makes blog posts easier to write and will be more enjoyable for your readers to read. I do use WordPress for my blog platform, but you don’t need to know html coding when you’re just starting out as long as you pick a theme that works for your website. Lots of luck on your blog! Thanks for a marvelous posting! I definitely enjoyed reading it, you will be a great author.I will be sure to bookmark your blog and may come back someday. I want to encourage yourself to continue your great writing, have a nice day! Thanks for reading! Hope you have a wonderful day as well. With havin so much written content do you ever run into any issues of plagorism or copyright violation? My website has a lot of unique content I’ve either created myself or outsourced but it seems a lot of it is popping it up all over the internet without my permission. Do you know any ways to help reduce content from being stolen? I’d truly appreciate it. You might want to just google it. I don’t use chapatcha on my blog so I can’t help you that much. Hiya! I know this is kinda off topic but I’d figured I’d ask. Would you be interested in trading links or maybe guest writing a blog post or vice-versa? My blog goes over a lot of the same subjects as yours and I think we could greatly benefit from each other. If you happen to be interested feel free to send me an e-mail. I look forward to hearing from you! Awesome blog by the way! No problem. I’m using WordPress for my site. Hey there! Someone in my Myspace group shared this website with us so I came to take a look. I’m definitely enjoying the information. I’m bookmarking and will be tweeting this to my followers! Terrific blog and great design and style. Thanks for coming and checking my blog out. Thanks so much for reading! I’m glad your enjoying my blog. Have a great rest of your week. We absolutely love your blog and find many of your post’s to be exactly I’m looking for. Do you offer guest writers to write content for you personally? I wouldn’t mind writing a post or elaborating on many of the subjects you write about here. Again, awesome web log! Thanks so much! I am not currently looking for guest writers, but if I do I’ll let you know. Hmm it seems like your blog ate my first comment (it was super long) so I guess I’ll just sum it up what I submitted and say, I’m thoroughly enjoying your blog. I too am an aspiring blog writer but I’m still new to everything. Do you have any suggestions for beginner blog writers? I’d definitely appreciate it. I do use WordPress. You don’t really need to know html coding when you are just getting started. Best of luck! Exceptional post but I was wondering if you could write a litte more on this topic? I’d be very grateful if you could elaborate a little bit more. Thank you! Hi outstanding website! Does running a blog like this require a lot of work? I’ve virtually no understanding of coding but I was hoping to start my own blog soon. Anyway, if you have any ideas or tips for new blog owners please share. I know this is off subject however I simply needed to ask. Appreciate it! Thanks for your marvelous posting! I genuinely enjoyed reading it, you’re a great author.I will be sure to bookmark your blog and will come back in the future. I want to encourage yourself to continue your great work, have a nice weekend! Do you mind if I quote a few of your articles as long as I provide credit and sources back to your site? My blog is in the very same area of interest as yours and my users would really benefit from some of the information you provide here. Please let me know if this alright with you. Many thanks! I don’t have an issue with you quoting my articles as long as you source back. Cheers! Have you ever considered about including a little bit more than just your articles? I mean, what you say is fundamental and everything. However think of if you added some great visuals or videos to give your posts more, “pop”! Your content is excellent but with images and clips, this site could certainly be one of the very best in its field. Great blog! I’m really loving the theme/design of your site. Do you ever run into any browser compatibility problems? A couple of my blog visitors have complained about my website not operating correctly in Explorer but looks great in Firefox. Do you have any ideas to help fix this problem? I haven’t found any browser compatibility problems with my website. I would check on Explorer yourself to see if there is actually an issue, or if it’s just their computer that is causing the issue. There are sometimes spam comments complaining about issues that don’t actually exist with your site. Hope it works out! My developer is trying to convince me to move to .net from PHP. I have always disliked the idea because of the costs. But he’s tryiong none the less. I’ve been using WordPress on a number of websites for about a year and am concerned about switching to another platform. I have heard very good things about blogengine.net. Is there a way I can transfer all my wordpress posts into it? Any kind of help would be really appreciated! My theme is based off Twenty-Eleven. I had some help making a few tweaks to get it to where it is now, but that shouldn’t be an issue for you. It isn’t too difficult to set up your own blog. If you’re not sure if you can take care of the technical aspect I would suggest starting out on a platform like Blogspot. Then you can get yourself established as a blogger without having to worry about the technical aspects. Howdy excellent website! Does running a blog such as this take a great deal of work? I’ve very little understanding of computer programming but I was hoping to start my own blog soon. Anyways, if you have any suggestions or tips for new blog owners please share. I know this is off topic but I just had to ask. Appreciate it! Running a blog does take quite some work, but as long as you keep up with it and write about what you enjoy you should be set. Best of luck! Not a problem. I used the Twenty-Eleven theme from wordpress and tweaked it a bit to work with my blog. Best of luck on your blog! Hey! This post couldn’t be written any better! Reading this post reminds me of my previous room mate! He always kept chatting about this. I will forward this write-up to him. Fairly certain he will have a good read. Many thanks for sharing! Please let me know if you’re looking for a author for your weblog. You have some really good articles and I feel I would be a good asset. If you ever want to take some of the load off, I’d absolutely love to write some content for your blog in exchange for a link back to mine. Please shoot me an email if interested. Thank you! Thanks for the offer. If I decide to bring in a guest author I’ll keep you in mind. Cheers! It’s a shame you don’t have a donate button! I’d certainly donate to this superb blog! I guess for now i’ll settle for book-marking and adding your RSS feed to my Google account. I look forward to fresh updates and will talk about this blog with my Facebook group. Chat soon! Woah! I’m really digging the template/theme of this site. It’s simple, yet effective. A lot of times it’s tough to get that “perfect balance” between superb usability and appearance. I must say you have done a amazing job with this. Additionally, the blog loads very fast for me on Chrome. Excellent Blog! Thanks for your marvelous posting! I really enjoyed reading it, you can be a great author.I will make sure to bookmark your blog and may come back in the future. I want to encourage you to continue your great job, have a nice weekend! Good post however , I was wondering if you could write a litte more on this topic? I’d be very thankful if you could elaborate a little bit more. Thank you! Fantastic site you have here but I was wanting to know if you knew of any forums that cover the same topics talked about in this article? I’d really love to be a part of group where I can get comments from other knowledgeable individuals that share the same interest. If you have any recommendations, please let me know. Many thanks! Greetings from Ohio! I’m bored at work so I decided to browse your website on my iphone during lunch break. I love the information you provide here and can’t wait to take a look when I get home. I’m amazed at how fast your blog loaded on my mobile .. I’m not even using WIFI, just 3G .. Anyways, amazing blog! Appreciating the commitment you put into your site and in depth information you provide. It’s nice to come across a blog every once in a while that isn’t the same out of date rehashed information. Great read! I’ve saved your site and I’m adding your RSS feeds to my Google account. I adore your wp theme, exactly where did you download it through? You can just search it through the theme database in wordpress. Hi there! Quick question that’s totally off topic. Do you know how to make your site mobile friendly? My weblog looks weird when browsing from my iphone4. I’m trying to find a theme or plugin that might be able to fix this problem. If you have any recommendations, please share. Thank you! Hi! I’ve been reading your blog for a while now and finally got the courage to go ahead and give you a shout out from Humble Texas! Just wanted to say keep up the fantastic job! Hi! I’m at work surfing around your blog from my new iphone! Just wanted to say I love reading your blog and look forward to all your posts! Keep up the outstanding work! Hey there would you mind letting me know which hosting company you’re using? I’ve loaded your blog in 3 completely different internet browsers and I must say this blog loads a lot quicker then most. Can you suggest a good web hosting provider at a fair price? Thanks a lot, I appreciate it! I would suggest checking widgets available through twitter. Howdy great blog! Does running a blog like this take a great deal of work? I have no expertise in programming however I was hoping to start my own blog in the near future. Anyhow, if you have any recommendations or tips for new blog owners please share. I understand this is off topic however I simply needed to ask. Many thanks! My partner and I stumbled over here from a different website and thought I may as well check things out. I like what I see so i am just following you. Look forward to going over your web page again. I really like what you guys are usually up too. This kind of clever work and exposure! Keep up the wonderful works guys I’ve you guys to our blogroll. Hey there! I’m at work surfing around your blog from my new iphone 3gs! Just wanted to say I love reading your blog and look forward to all your posts! Keep up the superb work!